Can you imagine? i kind of feel jealous too its breath taking. Yes, absolutely amazing. Particularly when it is went and cold outside, this image is far too tempting! oh my goodness, that garden like that, is divine! Yes, I can picture cocktails by the pool at sunset. Have a great wednesday night. Yep...you have gone & made me jealous alright! It is gorgeous! Thanks for sharing it! Kellie, this is a pretty special place, indeed! 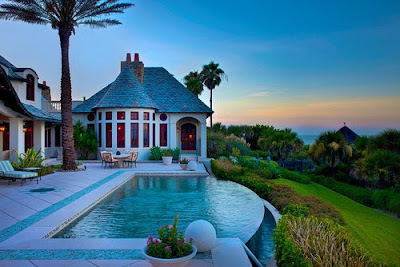 Very beautiful home, I love the view and that pool is adorable. this is gorgeous...and yet i would love to be there....and wishing i could be....but then i think of 'everyone' else in the world and how most of them don't even have what i have...and i feel content again! it's always nice to dream though! With the pool and the sunset, it looks absolutely magical! I'm definitely jealous of that homeowner. Love that pool! yes. just a wee bit jealous. would LOVE to be there RIGHT now!! I would sit outside all the time if I lived there.